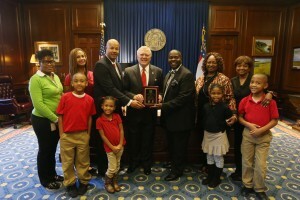 Ronald E. McNair Discovery Learning Academy was honored by Georgia Gov. Nathan Deal and the 2015 Georgia Red Ribbon Campaign for promoting drug-free activities during Red Ribbon Week. The Red Ribbon Committee at McNair Academy set several goals for the 2015 Red Ribbon Campaign, including raising awareness of the benefits of a drug-free lifestyle and fostering partnerships to reach that goal. According to Principal Brian Bolden, a host of local community/business entities, including the Sara Muhammad School, participated in the school’s efforts. Themed promotional activities included “Team Up Against Drugs,” “Drugs Will Have You All Mixed up Day,” “Living Drug-Free Is No Sweat,” and a Red Ribbon Community Parade. The parade featured local television and sports celebrities throughout the Atlanta Metropolitan Area. McNair Academy students also made Breast Cancer Awareness Cards for patients and survivors of breast cancer as part of a service project.